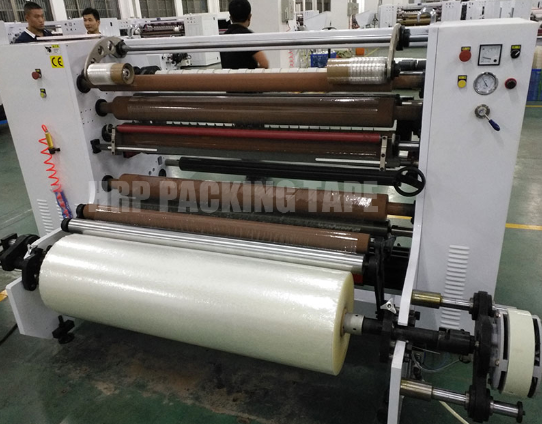 Although the Adhesive Tape Manufacturing Machine blade is small, it must be arranged for special maintenance and maintenance by the special person, and the operator must be familiar with the structure and performance of the machine tool. It is strictly forbidden to use circular blades for overload, and it is not allowed to shear hardened steel and hard steel, high speed steel, alloy steel, castings and non-metal materials. 1. The blade edge of machine which buy from Adhesive Tape Manufacturing Machine Exporter should be sharp and the edge is blunt or damaged. It should be repaired or replaced in time. When multi-person operation, there should be a special person to command, and coordination should be coordinated. It is forbidden to cut two different specifications of materials at the same time on the slitting blade, and it is not allowed to overlap the shear. 2. When cutting the material, do not allow the handle to promote the operation under the pressure plate. When cutting the material, the iron plate should be pressed separately. When cutting the material, the finger should be at least 200 mm away from the knife edge. After holding the line, you should immediately remove the to cut, such as the iron plate has moved, apply the wooden pillow to plug, so as not to press the foot down and hold the wound. 3. The workpieces cut by the cutting machine blades must be placed stably, not stacked too high, and not allowed to be stacked on the aisle. The corners and scraps should be cleaned up in time to keep the site clean and tidy. Previous: What Kind Of Clear Packing Tape Can't Be Bought? Next: Is Self Adhesive Tape Jumbo Roll The Thicker The Better?